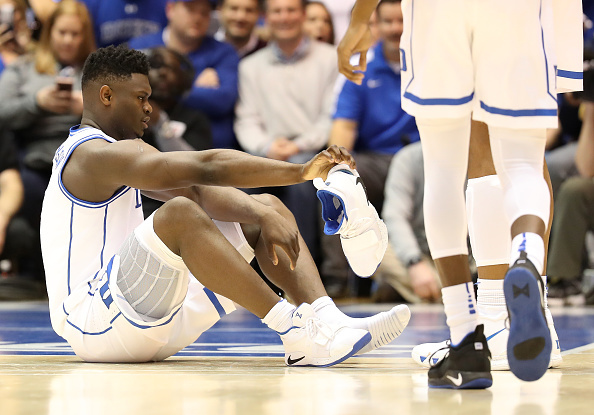 34 seconds into Wednesday night's highly anticipated showdown between the #1 Duke Blue Devils and #8 UNC Tar Heels, Duke's star freshman Zion Williamson ripped through his Nike PG 2.5s and immediately left the game with what the team later described as a mild knee sprain. Williamson, the projected #1 overall pick in the 2019 NBA Draft, did not return to the game and may opt to sit out the remainder of his freshman rather than risk another freak injury. The Blue Devils were unable to recover after their star player exited the game, as the Tar Heels dominated en route to an 88-72 victory. "It put everyone in the position of having to figure it out, playing without him, while playing a really good team. It's not a good situation," Coach Mike Krzyzewski said. "At halftime the realization that he's not there settled in. And we played horrible to start the second half. The final 16 minutes I thought we played really well, but it was too late." In 26 games this season, Williamson is averaging 21.6 points to go along with 8.8 rebounds per night.